The titanium gate snap from Berkeley Point is a cross bewteen a clip and a carabiner. The gaye snap is large enough to be clipped to a belt loop, a backpack or a pouch, so it can be used as the end attachment point for your keychain. The hole at the bottom can be used to thread paracord or chain, it can also be used for a large splitring, a smaller one might be hard to install since the width of the titanium borders can be problematic, we all know how painful tight splitrings can be sometimes. Constructed from Titanium the gate snap will resist wear, corrosion, impacts and daily abuse. I found them practical for keychains and lanyards made with paracord as the end attachment for belt loops but there are a zillion possible usages. There are two sizes: 1-15/16'' and 2-7/8'' that cost $22 and $36 respectively. You can find more information or order from Berkely Point. 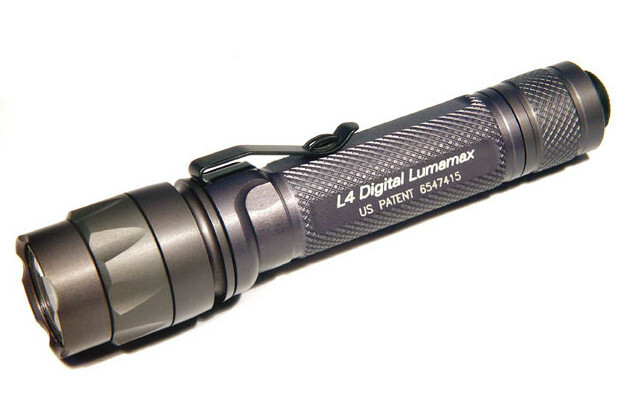 The L4 is the brightest led flashlight from Surefire's E-Series. The body, tailcap and bezel are compatible with parts from the E1L, E2L, E1E and E2E flashlights. The bezel is a KL4 a 5watt Luxeon led capable of producing up to 100 lumen which puts the L4 as one of the brightest led flashlights you can get. The beam of the L4 is a typical pure flood beam, that means the L4 produces a "wall of light" instead of a focused beam. This kind of beam is great for illuminating rooms or nearby objects but doesn't have the "throw" to light up distant objects. Small as it looks this flashlight can produce a lot of light. The light is powered by 2 C123 lithium batteries, 3.7v rechargeables must not be used since that can damage the led, if you want to use rechargeables you should get a 17670 protected rechargeable lithium-ion battery. The runtime on regular 123 batteries is about 1 hour. In some forums you might also be able to get a 2 stage tailcap switch that will make the L4 a two stage light with a extremely long runtime in low and extremely high brightness on high. The two stage tailcap with the 17670 rechargeable battery make the L4 one of the nicest EDC lights you can have. You can read specs for the L4 in Surefire's website. And you can order ir for $165 from this site. This small keychain device has two functions, on one end it has a small incadescent flashlight in the other end there is a speaker for a 120db alarm which is the interesting thing. The alarm is activated using a red button on the side of the device, you can press lightly for momentary alarm/whistle or press a little harder and the switch will click and the alarm will sound constantly, to deactivate simply click the red button again. The sount of the alarm is loud and pitchy and certainly attracts attention, you can use it as an electronic whistle or as a safety device in case of danger. 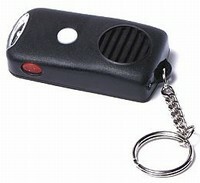 The small flashlight is useful when using your keys or to find something in the dark. It is a useful little device that goes unnoticed and might help in case of an emergency or dangerous situation. The device is powered by an A23 battery, not very popular but easy to find, the same kind of battery that powers gloo-toobs. The model in the picture costs $15 and can be ordered from this site. The Subcom is a very small folder designed by Chad Los Banos. It is only 1 7/8'' long and 1/16'' thick, weighting just 2.5 oz. This makes the Subcom a non threatening knife that you can carry in most cities without breaking the law and that you can use in plain sight without getting worried looks. The subcom looks "cool" and is certainly more a tool than a weapon for most people. 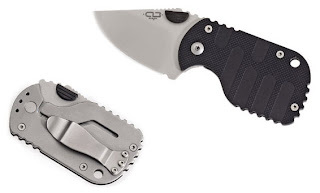 The beauty of the design is that in a very small folder you get a lot of cutting surface, the blade is a bead-blasted AUS-8 stainless steel with a framelock lock and ambidextrous thumb studs to open it. You can get it in a plain or serrated edge. The pocket clip can be used to clip the knife to a pocket or to use it as money clip. The handle is fiberglass reinforced nylon offering a very good grip and can be either black or silver. You can read more in Boker's website. Or order it for $25 from Knivesplus.